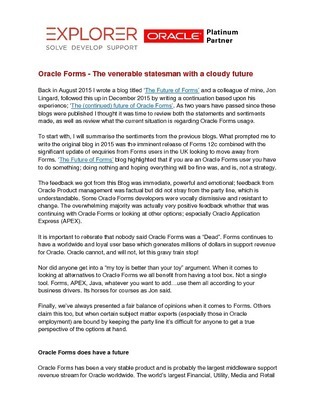 Oracle Forms has been a very stable product and is probably the largest middleware support revenue stream for Oracle worldwide, but as more browsers are de-supporting java, and business models are moving more towards cloud SaaS mindset, does Forms have a future? The answer is yes, but it’s going to take some work. If you choose to stay loyal to your Forms estates in this new cloud-first market, read this white paper to explore what options are open to you, to decide what the best course of action is for your organization.